Have you thought about coming to Rio de Janeiro on the month of your birthday? If so, we gift you with one free night on your stay. Discover, experience, travel. Those are our wishes to you from El Misti Hostels! The promotion lasts the whole month of your birthday. It does not apply on special dates, holydays or weekends. The booking must be made by the birthday boy/girl. It must be proved with a document. 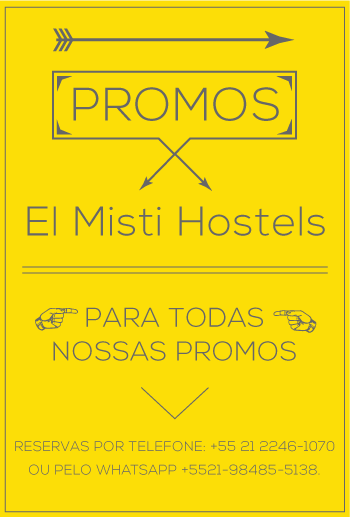 The promotion is valid in all units of El Misti Hostels chain. Bookings by phone: 08000 202661 ou +55 21 2547 2661. Promotion for limited time and subject to availability. Valid only for shared rooms. Get discounts of up to 30% for booking in advance! Bookings via telephone: +55 21 2547 2661. Contact our Reservation Centre to book your place at El Misti and pay less by doing so.Check out the offer’s terms and conditions. It is not combinable with any other promotion. Bookings via: +55 21 2547 2661. Those who row towards the highest waves and make of their holidays a Surftrip check out the promotion El Misti has for you. Surfpackers: 50% off on your stay at any of our hostels in Brazil!! Don’t miss out on it. 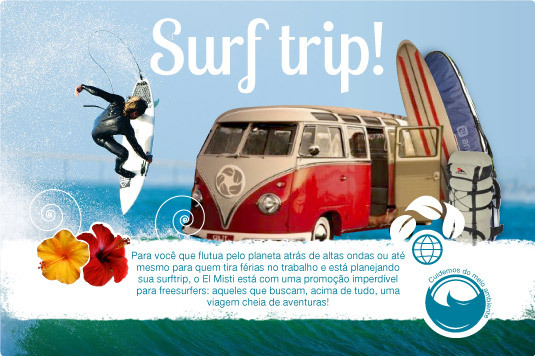 To participate of the promotion it’s required to prove the surftrip with pictures and material of the trip. The promotion is valid for all units of the chain El Misti Hostels & Pousadas. The promotion is not valid from December to March, special dates or events such as Rock in Rio, New Year’s, Carnival or Easter. Bookings at: 08000 202661 or directly at our hostels. Valid only for shared dorms. In order to provide the best service to our guests we seak to make the difference. 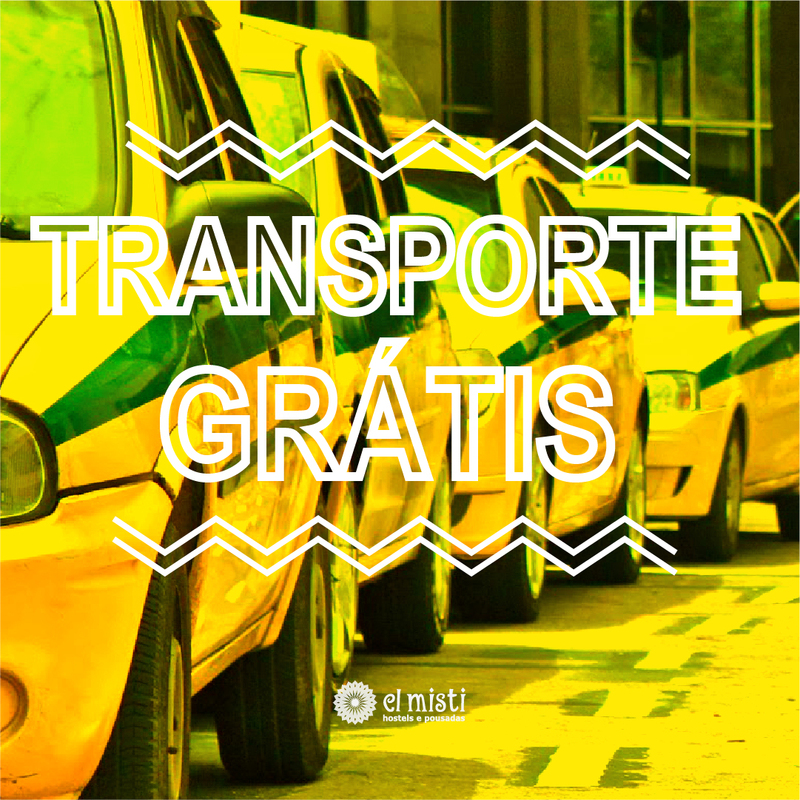 El Misti Hostel offers a free pick up service on arrival from the airport to our hostel. You’ll get here quickly to start enjoying. For bookings of 1 to 3 people – 1 taxi : The total booking value must be equal to or higher than: Botafogo R$ 450, Copacabana R$ 500, Ipanema R$ 600 and minimum stay of 4 nights per guest. For bookings of 4 to 6 people – 2 taxis: The total booking value must be equal to or higher than: Botafogo R$ 900, Copacabana R$ 1000, Ipanema R$ 1200 and minimum stay of 4 nights per guest. It is not a transfer out. Please note that in case of delays in the flights, the passenger is responsible of informing the El Misti Hostel about the new arrival time. In case the passenger has not informed our staff about the delay, El Misti Hostel won’t be responsible for the transfer charge. The passenger will have to be responsible for the total amount of the transfer in. This free transfer service is offered only between 07.00 am and 10.00 pm. For the New Year’s & Carnival packages the free transfer is offered only between 08.00 am and 08.00 pm. In case you require a transfer outside this time frame, we offer you the possibility of booking it with El Misti Hostel. The transfer is not confirmed until the hostel notifies so. We need you send us your flight details at least 48 hours before your arrival. The free pick up is not valid for bookings of over 6 persons. The free pick up is only valid at Galeão International Airport with Aerocoop and at Santos Dumont Airport with Uber. Walk up to the Uber Lounge, located at Bossa Nova Shopping, ask for the service and we’ll deduct the amount from your booking. Planning is getting easier! El Misti has some benefits to offer to those who plan in advance,. Book four nights at any El Misti Hostel and pay for three. Check out the terms and conditions of use start planning. The promotion is not valid from December to March, on holidays, events or special dates such as: Rock in Rio, New Year’s, Carnival, Holly Week, Olympic Games, etc. Of the 4 days of stay it’s discounted the cheapest one. Private rooms do not have 4×3 promo, they do have a 10% discount in the total amount of the booking though. Not valid for El Misti Ipanema. Travel around with El Misti and get increasing discounts! As from your second El Misti destination you get increasing discounts: 5% on your second destination, 10% on your third. Check it out! Travelling gets easier. For those who are always looking to reach the top peaks and plan their destinations according to the height, don’t miss out on the Climbpackers promotion El Misti Hostels chain has for you: 50% off in any of our hostels. To apply for this promotion it is required proof that the purpose of the trip is climbing with pictures and equipment. 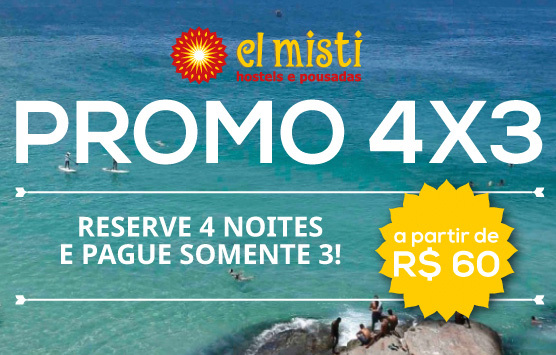 The promotion is valid for all units of the El Misti Hostels Chain throughout Brazil. The promotion is not valid from December to March, vacations, events or special dates such as: Rock in Rio, New Year’s, Carnival or Easter. Bookings via: 08000 202661 or directly at our hostels. Cycling lovers who make of it their mean of transport have a mandatory stop at El Misti. 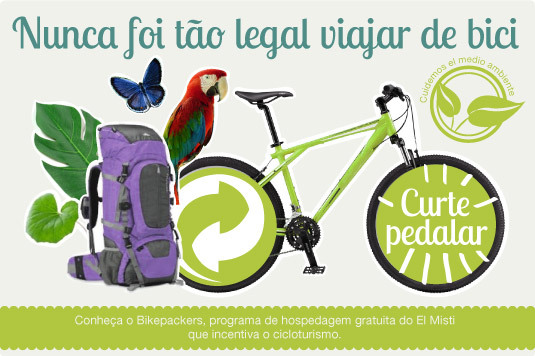 The Bikepackers program offers 5 free nights at any El Misti to adventurous bikers that have Rio in their travelling schedule!! To apply to the program it is required to be travelling by bike alone or with a group and prove it with documents and pictures. The guest must provide the travelling schedule to our sales team. The program is valid in Botafogo hostel and offers 5 free nights. Nights are individual and valid per person (5 nights in a row) or for groups to have them divided within the members. The number of nights is not accumulable.